Appachan identifies his children based on their food preferences. Akhil is the meat person and that only includes fish. And I’m the fruit person. To be more specific, the mango-person. Amma always talks about Appachan’s excitement when my brother and I go home for summer break. She tells us that Appachan must have walked for kilometres to his trusted shops to get the best for both of us. The 9-year old me registered the fact that the repeated usage of the word “Thoppumpady” and “Post Office” to the driver would somehow direct us home, but mainly to the juicy, pulpy mangoes that Appachan must have kept aside for me. After our Esho mishiyaku sthuthi ayirkate (Praise the Lord) and a kiss on the cheek, Akhil and I have to sit at the dining table. There is no “How was the trip?” or “Go freshen up”. A variety of fruits are arranged in front of us and we’re expected to eat it immediately. But it is the mangoes that always gets our attention. It is that time of the year where Appachan does not forgive the crows and dedicates his time to protect the mangoes from them. He starts his inspection earlier than necessary. A trip to the terrace is like meditation every morning. Breathing in and out, he walks around the terrace, looking above every now and then at all the mangoes that slowly grow in our backyard. He plucks them even before it is ripe and stores it in his cupboard with a cloth. Yes, Appachan has trust issues with the crows and sometimes, even with nature. Appachan does not like to cut the mangoes and store them in the fridge like Amma. And I agree with him. Why wait for so long? How could one not enjoy the skin of the mangoes being slowly peeled away so smoothly, slice it into pieces and immediately eat it? Amma taught me the importance of the mango skin. She watches Appachan unconsciously peel the flesh of the mango along with the skin. And just as he puts them on the plate, her hands slowly crawl towards it and takes it away. Let’s just say that she makes sure that only the skin is left. Once the peeling process is complete, he slices them into huge rectangles and passes them to each of us. My tiny hands hold them together and sometimes squish them too aggressively when I’m unable to wait any longer. The juice of the mango drips and slowly slides down my hands, tempting me to lick it. While my little mouth stays with that one big piece, my eyes would fall on Papa popping three of the pieces like they were gems. Papa says that it was the only time in my entire life I was so angry and competitive. Hence, I prefer having Akhil around as I feast on my mangoes. Akhil is choosy about the kind of mangoes he eats, even today. He does not touch the overly – ripe ones nor the ones he feels has too much fibre. He likes his mangoes with a smooth surface with none of the fibres getting stuck between the gaps of his teeth. I think, he likes Alphonso mango. It fits the description. 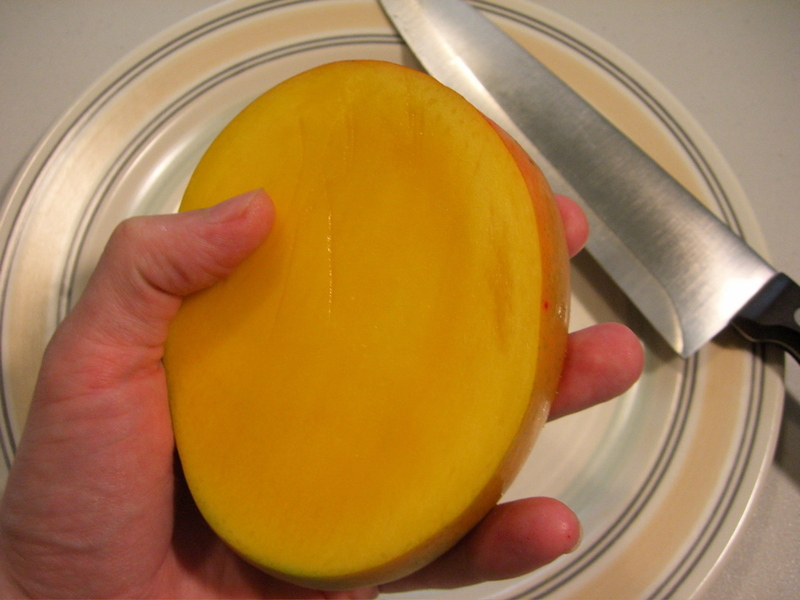 My personal favourite is the Ko Maanga, the only mango that I eat with its skin. Appachan introduced it to me when I was 16-years old. It was the summer where Amma and I decided that Appachan and Ammachi must come to our house rather than staying inside theirs all the time. We sent Akhil to pick them right before lunch. Little did we expect Appachan to fill the entire trunk with different kinds of mangoes. Ko Maanga was one of them. He sat me down as Ammachi went to the kitchen and revealed to me that the skin of the mango could be eaten. It took me a while to realize that he was not joking. Commanding Ammachi to wash the mangoes and bring a knife along with it, he would give me the directions to the only shops I should be buying it from. Rather than arguing that I’ll never shop or cook or live in Kerala, I nodded, waiting to experience my first bite of the mango-skin. Once set, he made long thick slices and gave it to all of us. Appachan took the first bite to prove that it was okay. Following him, I took mine. Between the crunchiness of the skin with the flesh of the mango flavouring it up, I was mind-blown. I lost count of the number of Ko Maanga’s I had, but enough to disappoint Amma when I skipped lunch. While Appachan talks about the world issues and politicians, my eyes follow the mangoes swaying around his hand. It’s the seed of the mangoes that mattered to me. Again, this was Amma’s doing. She used to tell me about the fights she and her sister used to have just for the flesh stuck on the seed. I decided I wanted to be a part of it too. Luckily, being a grand-daughter has its advantages. Appachan gives me the first seed allowing me to scrape off every bit of the flesh from the seed using my teeth while my hands held it. The fibres, just like my brother hated, would get stuck between the gaps of my teeth. But it never mattered to me. I was part of a competition that never existed and I won.